Jared Leto has seen many achievements across two extremely successful careers as an actor and musician. His role as a method actor, completely immersing himself into a character for the duration of shooting, has earned him an Academy Award, a Golden Globe and a Screen Actor’s Guild Award. He is also the lead vocalist, multi-instrumentalist and main songwriter for Thirty Seconds to Mars, a band he started with his brother in 1998 that has since sold over 15 million albums world wide. His business ventures include the launch of a successful social media management and digital marketing company called The Hive, an exclusive full service business for managing concerts, festivals and events called Adventures in Wonderland and VyRT, a live video-streaming service. He also launched an airline (believe it or not) that flies between twelve destinations in California and includes a fleet of eleven planes. Leto is an animal and gay rights activist, leads a vegan lifestyle and is an avid philanthropist. That being said, he clearly knows what he’s doing when it comes to running a business. CreativeLive’s CEO, Chase Jarvis, had a chance to sit down with Leto and chat about what methods he’s used to find success, including the importance of asking questions, taking action without permission and why failing is a good thing. Leto talks about the importance of diving deep and asking questions, in terms of acting in a role, but it’s really applicable to any aspect in life that you’re looking to investigate further. Researching a target audience, for example. It’s about investigating this new space you’ve been introduced to and uncovering what’s there. You do this by “diving deep” and asking specific questions. The deeper you dive, the greater your reward will be. You’ll be able to offer a greater contribution, with more truth and authenticity, by completely immersing yourself in the subject. He also suggests starting with an extremely low baseline and having no assumptions. That way, you’re open to any answers you may find along the way, and able to go in any direction those answers take you. Leto says he often has no idea where he’ll end up. It’s one of those cases where the value is in the journey, not the destination. In this video, Leto talks about the importance of taking action without waiting for permission to do so. Having an independent spirit and not caring (too much) will push you further towards your goals. The most successful entrepreneurs are bold and fearless–they make decisions without asking for permission first. By being independent-minded, you end up doing a lot of different things than if you were asking the “gate keepers” to approve every one of your new ideas. Technology is great in this sense because it allows you to put yourself out there and share your ideas without having to overcome any obstacles first. Although it might be harder than ever to find quality content and even an audience, it’s a wonderful time to be able to speak your mind and share your voice without having to ask for permission first. Failure is an integral part of success. It’s inevitable, but if you can harness the opportunity it brings with it, you will find yourself with a wider, more satisfying spectrum of success ahead of you. Obviously, huge achievements take huge amounts of effort and time. With those efforts and during that time, you’ll probably fail. A lot. 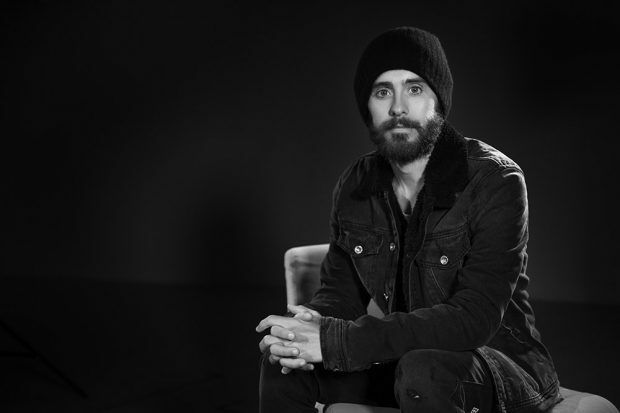 Leto talks about writing hundreds of songs just to come up with ten that will make the album, or shooting for five hours just to get 90 minutes that are watchable. He says that failure leads to success, and success leads to failure. This is true, because the more you fail; the closer you get to succeeding (if you internalize the lessons to be learned each time). And if you succeed too early, too easily or too often, you will inevitably fail to some degree, in the long run. Leto references Andy Warhol’s philosophy to keep making art, and let other people decide whether it’s good or bad, but to just what you have to do and not worry about other people’s opinions. It’s a great, simple philosophy to live by because from failure comes the most beautiful reward and result. 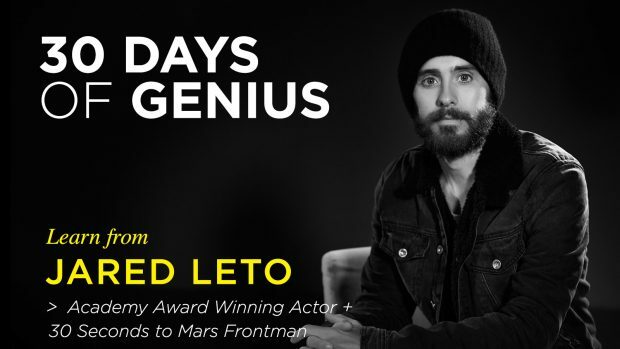 Both Jared Leto’s philosophies and style of communication are different from the usual entrepreneurial shticks in the game. Because he’s an extremely creative artist, actor and musician, he brings a fresh point of view than what we’re used to in the aggressive world of business. 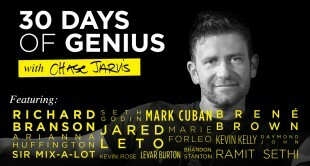 For more with Jared Leto, watch the full interview on 30 Days of Genius with Chase Jarvis.